Investing in a heart rate monitor is one of the best things that happened to my fitness routine. Originally, it was the count of calories burned that appealed to me. Becoming aware of my heart rate helped me develop a new realization of my body and my cardiovascular health. Mine is the Polar FT4. It’s functions are basic; it records my heart rate through a waist band (seen below). I can look at my wrist at any point during my workout to see what my heart rate is at and how many calories I’ve burned. Each time I workout with my Polar FT4 it records my workout and I can look back at previous workouts as well. I can also set a “heart rate zone” and at the end of my workout see how much time I spent in that specific zone. At first, the waist band was uncomfortable to wear but after the first few workouts it wasn’t a problem. 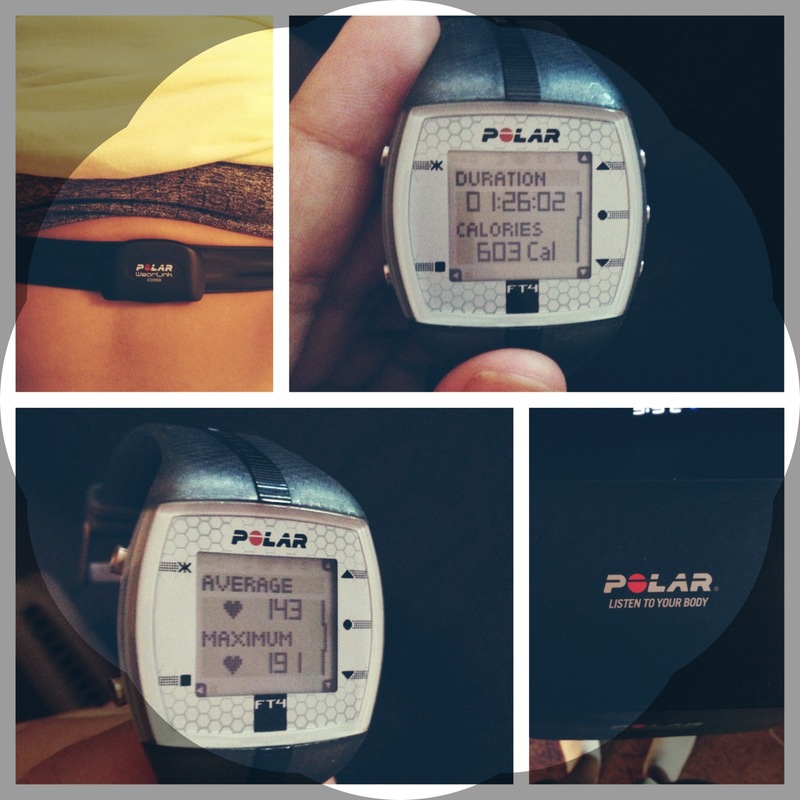 Why has my Polar HRM improved my workouts? Whether you are looking to burn fat or improve your cardio, knowing your heart rate while working out is extremely important. Personally, I like to do interval training at the gym so being able to look at my heart rate at any point is vital. Discovering the heart rate zones specific to your body can help you achieve any fitness goal you have in mind. Try this link to learn about the heart rate zones specific to your body and needs. Today’s cardio equipment will calculate how many calories you burn however, this number is frequently false. There are many factors such as height, weight, and heart rate that will affect the amount of calories you burn. My polar watch uses all those factors to give me an accurate number of calories I burn. For example, the elliptical told me I burned 78 calories in 9 minutes, whereas my polar watch gives me the correct number, which was 60 calories. Aside from cardio, my HRM also tells me my heart rate during any strength training exercises. Before my polar watch it was always a mystery to know how many calories I burned, or what my heart rate was during strength training exercises. By knowing your heart rate during strength training you can establish interval workouts and learn how your body responds to certain stress. Learning about your body’s heart rate and calorie expenditure is a great advantage to achieving any fitness goals you have in mind. However, it’s easy to become obsessed with the amount of calories you burn. Use the watch with healthy goals in mind. Remember that calories are energy and obsessing over the calories in and out of your body can not only lead to stress but unhealthy habits. Check out the Polar website!